Dear Suzie, My husband keeps telling me I need to let it go. And days will go by when I feel that I truly have forgiven. But then something will trigger my anger. He’ll say something or I’ll hear something on TV, and it just brings it all back again. I know I can’t continue like this. My husband and even my kids walk around me on egg shells because at any moment something can set me off. Please help. Are you willing to question your interpretation of what it means to truly forgive? Here’s why I ask. 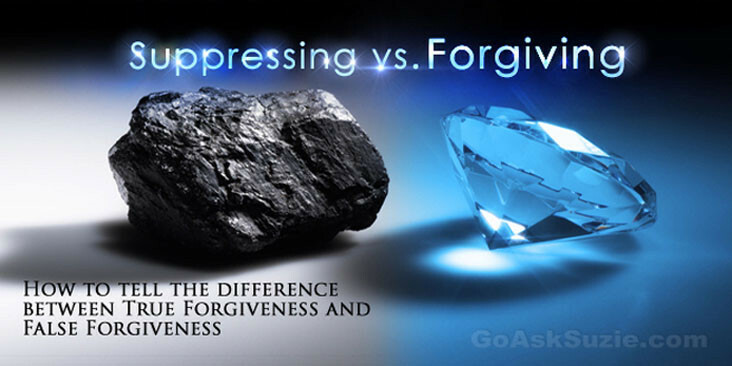 Many of us (especially those raised in the Christian tradition) are taught forgiveness as a religious principle. It’s important to add the insight that forgiveness is also a practical solution. In other words, embracing forgiveness gives you a lot of psychological and immediate benefits that you might not have thought about. Once you experience the psychological benefits of forgiveness, no one has to convince you of its powers. Once you have felt the shift, the change, the freedom, it’s a permanent game-changer. A lot of what is passed off as forgiveness isn’t actually true forgiveness. In fact, more people fake forgiveness than anything else, because they don’t understand the difference. This lack of insight is why there’s so much discouragement, frustration, and disillusionment surrounding forgiveness. Today, all that can change for you. 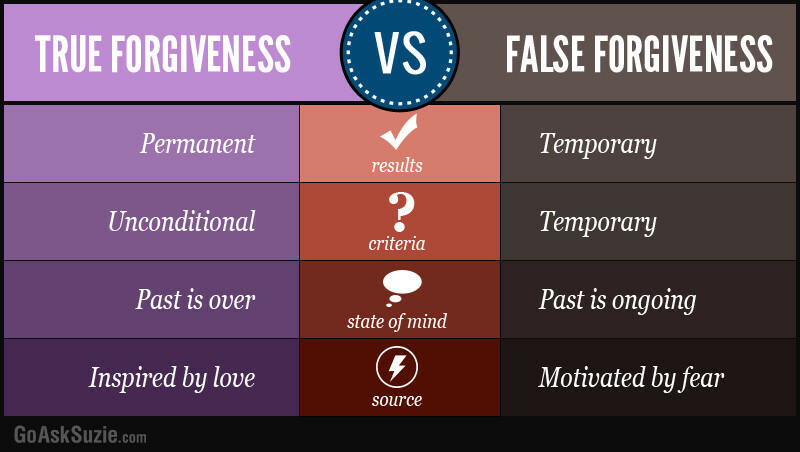 Coming up next… is a quick study guide to help you discern the difference between true forgiveness and false forgiveness (faking it). So, what is false forgiveness anyway? 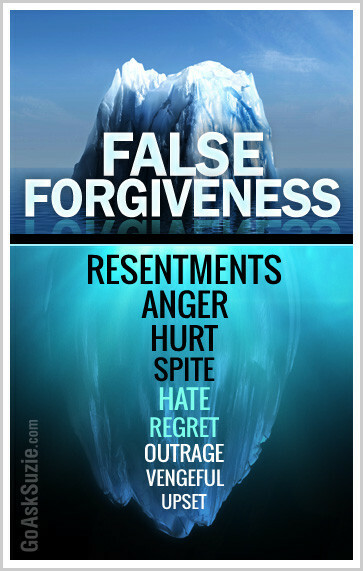 False forgiveness is a counterfeit (fake) forgiveness provisionally granted from a place of fear or ego. Then what is true forgiveness? True forgiveness is a genuine (emotional and spiritual) release that frees us from the past. True forgiveness is permanent. False forgiveness is temporary. True forgiveness is unconditional. False forgiveness has conditions. True forgiveness lets the past be over. False forgiveness keeps the past alive. True forgiveness is inspired by love. False forgiveness is motivated by ego. Notice… True forgiveness and false forgiveness come from two completely different sources. True forgiveness is inspired by Love. Its home is a compassionate heart. False forgiveness, on the other hand, is motivated by fear and ego. But how can you tell when it’s false forgiveness? Your painful feelings are buried, but not gone. They have a tendency to come up again. You fail to experience any release or sense of peace. You still have fantasies of revenge, getting even, and punishing the wrongdoer. You feel a kind of superiority or self-righteousness and want some kind of reward for having forgiven. You feel like forgiving is a favor you are granting. You expect certain terms and conditions to be met before you forgive. You forgive because of what you fear losing (your home, lifestyle, 401k, etc.). The past still has the power to hurt (no matter how long ago it happened). Let me give you an example of false forgiveness at work. Let’s say a wife appears to have forgiven her husband’s indiscretions, but her underlying motive for forgiving him is because she FEARS losing her home, her family, and her lifestyle. While those are all very important considerations, the fact is this: forgiving out of fear (of losing something) is still counterfeit forgiveness. It’s not real; therefore, it doesn’t stick! This isn’t really forgiving… it’s actually suppressing. You should know that suppressing is the most common form of fake or false forgiveness. If forgiveness is motivated from fear and not from Love, rather than releasing the hurt and resentment, what people attempt to do is bury them. But suppressed hurt and resentment are like vampires: they always rise again. Eventually, they will find ways to surface through the cracks of daily life. This is what makes suppressing so dangerous. It gives the illusion that the hurt is over when in fact, it’s simply hidden. A woman may not understand why she feels so irritable a lot of the time, or why she can’t be happy even when things are going well, or why she’s argumentative, or why sexual intimacy may actually be repulsive or indifferent to her. And although this woman might never make the connection, what she’s experiencing is the price of suppressing versus forgiving. Recently, I worked with a celebrity client who discovered her husband had a mistress in another city. When she got suspicious and called him on it, at first he denied any wrongdoing. But as usually happens, the truth finally came to light, and her husband confessed to his actions. Understandably, she was very upset. What happened next was interesting and a bit puzzling. You see, what really bothered her wasn’t the fact that her husband was sleeping with another woman (although I’m not saying she was happy about it). What REALLY bothered her was the thought of what others might think if they were to find out. That’s right! She was more concerned about how it would look if the media and public knew her husband was sleeping around on her, than about the fact that her husband was sleeping around on her. So, guess what she did? That’s right. She decided to forgive him. To her, taking him back was better than facing the public humiliation, so she buried the pain under the mantra of “boys will be boys” and TRIED to go on with their life. But let me ask you this. Do you think the pain really went away? Of course not. Why? Because there’s a HUGE difference between suppressing a painful experience and truly forgiving a mistake. One never works, while the other one always does.